Sri Lankans: you're all refugees, but you can't come to Australia! Sri Lankans: you're all refugees, but not in Australia! It's World Refugee Week, and it's June 2007. On Nauru, Sri Lankan and Burmese asylum seekers, held since the beginning of the year, are staging a protest. They're joined by Rohingya asylum seekers, who are stuck on Nauru since more than a year - from mid-2006. In a statement issued during the protest, they refer to themselves as "living corpses". It's a macabre sign of their mental state. Three months later, in September 2007, they stage a hungerstrike. The news soon reaches Australian media outlets, and just a week later the Immigration Department and the International Organisation for Migration, who manage the detention centre on the island, meet with them and give a commitment to complete their asylum claim assessments. After all, there is an Federal election looming in Australia. A week later, the assessment is indeed delivered - but nobody is to enter Australia to be resettled and find residence there. That's the non-negotiable condition. Below is some of the widespread media coverage of this slick, sly and sleazy completion of their asylum claim. Sophie Black, Crikey, Congratulations! You're a refugee! 3 July 2007: Sri Lankan Desperation on Nauru: "we now live with indefinite expectation..." - There's something eerie about refugees, locked up and away from their human rights, celebrating World Refugee Week - but that's exactly what happened in the week of 17th to 23rd June with the Sri Lankans we sent to Nauru after they sought Australia's protection. They sent us photos and a letter; here they are. 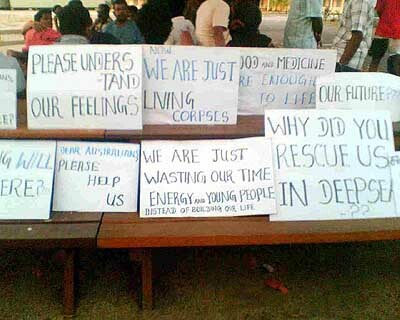 18 March 2007: The Sri Lankans: being a refugee just ain't cricket... - There's a widespread consensus amongst journalists, reporters and commentators that John Howard eventually closed Nauru, and that it was Labor that resurrected offshore processing. It's not true, Howard never closed Nauru. The deportation of 83 Sri Lankans to Nauru in 2007, under Immigration Minister Kevin Andrews, marked one of Howard's last callous anti-asylum seeker acts. The Sri Lankans were flown to Nauru after a secret plan hatched by Alexander Downer to dump them back in Indonesia, collapsed. WHAT kind of country has Australia become? This is the question Australians again have to ask themselves in the wake of the Federal Government's disturbing decision to deny 72 Sri Lankans, who have been found to be genuine refugees, the right to settle in Australia. What the Government has granted this group of Tamil men is the right to languish on Nauru Island until the Government finds another country willing to assume Australia's international and moral obligations to accept and resettle them. The men are in for a long and possibly fruitless wait. According to the the United Nations High Commissioner for Refugees, only about 4 per cent of asylum seekers processed on Nauru and Manus Island have been accepted by other countries. This sad, paltry figure is testament to the fact that other countries are reluctant to accept people they consider, with justification, to be Australia's responsibility. And, if past experience is any indicator, these refugees also face a traumatic life in detention, a life characterised by isolation and mental illness. Wednesday's decision is troubling, but not surprising. In February, the Howard Government foreshadowed this hardened stance prohibiting unauthorised arrivals from settling in Australia even when they had been found to be genuine refugees. Like the temporary protection visa, it is a tool being used by the Government to deter unknown people, often in unsafe boats, from arriving in Australia without a visa at a time when matters of border security are of obvious concern to many Australians. While, in the Government's terms, the policy has been successful, the question remains at what cost to Australia's international and moral standing? The Government also holds the firm view that unauthorised arrivals are "queue jumpers" and that those who aspire to be accepted into Australia should follow the correct channels and complete the necessary paperwork. While this is entirely appropriate in an ideal world, some people, such as those fleeing the chaos of the brutal internicine conflict in Sri Lanka, may not have the opportunity to line up in the proper queue. On the whole, Australia fulfils its duties as an international citizen and, relative to its population, pulls its weight in terms of accepting refugees from camps around the world. But its reputation has been sullied by its intransigence over the Pacific Solution and will be further besmirched by its unreasonable stand on these 72 unfortunate Sri Lankans. The Government needs to accept that these men have been found to be genuine refugees, people who according to the UNHCR have fled persecution in their homeland and face torture or death should they return. By failing to offer them permanent entry to Australia, the Government only demonstrates that it fails to understand their plight and that its moral compass has gone awry. As a civilised nation that acknowledges, and for the most part meets, its international humanitarian obligations, it should be welcoming what is a very small group of people and helping them rebuild their lives. What possible threat could they present? Australia has strong historical ties with Sri Lanka and a robust Sri Lankan community that would welcome them and provide a ready-made support network, which may not be available should they be cynically hand-balled to another country for resettlement. Australia should not forget that it is a signatory to the 1951 Refugee Convention, and in the spirit of that historic covenant it should take these refugees and rescind its decision to condemn them to a life of indefinite detention and indeterminate exile on Nauru. In doing so it would send a message to the world that it places its human rights obligations above its policies of deterrence. Anything else is a shameful denial of the right to sanctuary. I refer to your Refugee Status Assessment (RSA) by the Australian Government. We are pleased to inform you that after a thorough assessment of your refugee claims and careful consideration of all available information, the Australian Government has determined that you are a refugee as defined in the 1951 Convention and the 1967 Protocol relating to the Status of Refugees (Refugees Convention). Resettlement opportunities in other safe countries are actively being pursued on your behalf. You will be kept informed of our progress. As you have been found to be a refugee as defined in the Refugees Convention, you will not be returned to your country of claimed persecution and the current arrangements to provide you with support, including accommodation, food, clothing and medical care will continue. Crikey understands that none of the lucky recipients of the letter, or their lawyers, have been given any further indication of what part of the globe, and when, they might be sent to. Labor's immigration spokesperson Tony Burke had this to say this morning: "The truth is, of the people who have been resettled in Nauru, more than 1,000 have been resettled either in Australia or in New Zealand, where they subsequently get access to come to Australia. Fewer than 50 have been settled in Europe or North America." But with an election teetering on the horizon like the proverbial Tampa, these newly minted refugees are political poison -- so it's the USA (or New Zealand, or Scandinavia, or somewhere in Europe) or bust. But one refugee sector insider told Crikey that the men had "Buckleys and none," of going anywhere before the election, they're "not going to get off that island for a while." "I suspect that Andrews' spokesperson floating the possibility that the US could be considered is an absolute furphy, but it's probably very unhelpful at the moment. The last place in the lead up to an election campaign that you'd be thinking of resettling people, given that you never have before, would be the US," says the insider. David Manne from the Refugee and Immigration Legal Centre (currently representing 27 of the Sri Lankan refugees) told Crikey, "At this stage we have no idea of where or when they'll go." And the refugee sector insider says this extension of uncertainty is yet another failure of the Pacific Solution. "If these people were in Australia, they'd be released immediately ... When you look at the 43 Indonesians from Papua province earlier this year, once they were deemed to be refugees and were granted Australian protection, that release was immediate ... They were put on a plane to Perth from Christmas Island, then to Melbourne where the Papuan community welcomed them with open arms, they were repatriated in a matter of days." But for the Sri Lankan refugees unlucky enough to be taken to Nauru, the Australian government will have been furiously negotiating with countries like New Zealand and Sweden who have reluctantly taken refugees before to agree to do so again. "But those countries could say, as did New Zealand Prime Minister Helen Clarke did last time, Australia has an obligation under the convention, we do our bit, you do your bit..." says the insider. "You can subcontract your detention and processing but you cannot subcontract your responsibility under the UN convention for refugees." So how long are these men to be left in limbo? "I imagine there'd be pressure from Nauru to repatriate them quickly," Paul Power from the Refugee Council told Crikey. "But the experience with the Pacific Solution has been that other countries are reluctant to take responsibility for people they see as Australia's responsibility... You need a government that's supportive of Australian policy or a country like the US that has a similar perceived political problem that they would like Australia to assist with..."
The successful reduction in the number of people seeking to enter Australia unlawfully has been a direct result of the Howard Government's clear policy that persons who seek to enter Australia illegally will not be settled in Australia. Yet Crikey was also told: "Let's remember that the majority of unauthorised arrivals, people who land in Australia without documents or are seeking protection, arrive by air. We don't talk about that." Power agrees. "All the stats that are available about these so called unauthorised boat arrivals shows that the percentage of people who come to Australia in desperate circumstances in leaky boats are more likely to have valid claims than those who come by air," says Power. If asylum seekers are lucky enough to get their hands on a plane ticket, "They are processed on the mainland within 90 days..." says Power. Meanwhile, Manne says that his 27 clients have also lodged Refugee and Humanitarian Class XB visa applications under the Australian legal system "as is their entitlement". "In the absence of any evidence whatsoever that there is another safe country where our clients can be resettled, and in light of recognition of their refugee status," says Manne, "my clients have strong and compelling claims to be resettled in Australia promptly." Sri Lankan refugees detained on Nauru for six months have had their refugee claims approved but will be refused resettlement in Australia. The move has angered asylum seeker advocates who say Australia will be in breach of the Refugee Convention once again. Immigration Minister Kevin Andrews said 72 Sri Lankans who were among a boatload of 83 asylum seekers intercepted near Christmas Island in February had been granted refugee status. One had been refused as a refugee and two had been previously determined to be refugees. Eight cases were yet to be finalised, including six detainees charged over the sexual assault of a Nauruan woman. Despite approving the claims of 72 people, Mr Andrews immediately refused to allow the Sri Lankans to be resettled in Australia. "Australia is now exploring resettlement options in other countries for the Sri Lankans that have been assessed as being refugees," he said. "They will remain in Nauru while arrangements are made to resettle them elsewhere." Mr Andrews played down suggestions the Sri Lankans could be sent to the US under a refugee exchange deal agreed to in April between Canberra and Washington. Refugee groups said the refugees should be allowed to settle in Australia, given their claims were genuine. "As Australia was the place in which this group sought protection, it seems only fair that the Australian government should honour its commitment under the Refugee Convention and provide that protection in Australia," Refugee Council of Australia chief executive Paul Power said. "We should avoid this unnecessary delay and uncertainty by facilitating resettlement for this small group of refugees in Australia." Opposition immigration spokesman Tony Burke said despite the government's assurances the Sri Lankans would not be allowed into Australia, that was inevitably what happened with people processed on Nauru. "The truth is, almost everybody who has been resettled from Nauru ends up being allowed to live in Australia," Mr Burke said. Prime Minister John Howard had vowed before the 2001 election that refugees processed on Nauru would not be allowed to reach Australia, he said. However, more than 1,000 had since been resettled in Australia or New Zealand. Asylum Seeker Resource Centre co-ordinator Pamela Curr said the government was repeating past mistakes in seeking to resettle the Sri Lankans elsewhere. "They will languish on Nauru until they become so physically and mentally debilitated that Australia has no option other than to offer them a home here," Ms Curr said. "This is what happened to the Afghan and Iraqi refugees who waited on Nauru for over five years." Greens Senator Kerry Nettle said refusing the Sri Lankans permission to live in Australia was a "disgrace" equal to the Tampa affair. "Either Australia accepts its international obligations or it doesn't," she said. "Asylum-seekers must be able to live here if they are found to be refugees." Advocacy group Project SafeCom said third-country resettlement was "a sly act of bastardry". "These refugees are Australia's problem," spokesman Jack Smit said. "Trying to once again barter with other nations, and trying to sell refugees to other countries ... is a scandal and it will be further eroding Australia's international standing." The federal government initially wanted to send the Sri Lankans back to Indonesia - their last point of departure. But this plan collapsed when Jakarta indicated it would not allow them to be processed in Indonesia by the United Nations. A GROUP of 72 Sri Lankans intercepted en route to Australia from Indonesia in February have been accepted as refugees, but will not be allowed to live in Australia. The Sri Lankans have been held on Nauru for several months since their vessel was intercepted by HMAS Success near Christmas Island on February 20. Only one had been refused refugee status, Immigration Minister Kevin Andrews said today. Those assessed as being refugees would be resettled - but not in Australia, Mr Andrews said. "Australia is now exploring resettlement options in other countries for the Sri Lankans that have been assessed as being refugees," he said. "They will remain in Nauru while arrangements are made to resettle them elsewhere." In April, Canberra and Washington announced a deal allowing the two countries to effectively exchange refugees, with those held at Nauru able to be resettled in America and US-bound refugees detained in Guantanamo Bay sent to Australia. The Federal Government had initially considered sending the Sri Lankans back to Indonesia but this plan collapsed amid criticism they would be in danger after Indonesia indicated it would simply send the them back to Sri Lanka rather than allow the UNHCR to process them in Jakarta. The Sri Lankan Government had branded the group "economic refugees" and demanded Australia return them to their war-torn homeland. Mr Andrews said assessments for seven other asylum-seekers had not yet been finalised, while one man, whose status was yet to be determined, was receiving medical treatment in Perth. A further two had already been classed as refugees in Indonesia before setting off for Australia. The Immigration Department's decision to grant asylum to 72 out of 83 refugees but refuse them settlement in Australia is a disgrace equal to the Tampa affair, the Greens spokesperson for Immigration Senator Kerry Nettle said today. "This decision to grant refugee status to these people but refuse them settlement on the Australian mainland is Tampa without the ship", Senator Nettle said. "Either Australia accepts its international obligations or it doesn't. Asylum seekers must be able to live here if they are found to be refugees. "The Government's 'Pacific Solution' is an international embarrassment that must be relegated to the dustbin of history along with the Howard Government. "What part of the word "refugee" doesn't Minister Andrews understand? "The Howard Government should not leave these refugees in limbo like it has with so many refugees before. "Kevin Andrews must begin to take Australia's international obligations seriously by quitting his election driven agenda," Senator Nettle said. MORE than 70 Sri Lankan asylum seekers on Nauru have been found to be genuine refugees but will not be allowed to resettle in Australia, prompting fears they could remain in indefinite exile on the tiny island. Just days after the end of a hunger strike on the island, Immigration Minister Kevin Andrews yesterday announced 72 of the 83 Tamils, who were intercepted in international waters in February, had been assessed as being refugees. However, Mr Andrews said, Australia was seeking to resettle the men in a third country and they would remain on Nauru until arrangements were made to settle them elsewhere. "The successful reduction in the number of people seeking to enter Australia unlawfully has been a direct result of the Howard Government's clear policy that persons who seek to enter Australia illegally will not be settled in Australia," Mr Andrews said. The decision has angered refugee advocates, who say the men could be left languishing indefinitely on Nauru, with the Government expected to struggle to find a third country that is prepared to take them. Immigration lawyer David Manne, who represents 27 of the 83 Sri Lankans, said the men had been rightly recognised as refugees but remained stuck in a terrible predicament. "There is no proper process and no proper plan which will guarantee these genuine refugees will be resettled in a place of safety and security where they can rebuild their lives," he said. "The concrete evidence in the past is that people, having found to be genuine refugees, have languished in limbo for years and fallen apart on Nauru because other countries around the world were not prepared to take up Australia's responsibilities to these people to protect them." One group of more than 50 asylum seekers spent more than 3½ years on Nauru. Half were resettled in 2005 after a mental health team warned that several were suicidal. Of the first group of more than 1200 asylum seekers to be processed on Nauru, more than 480 were resettled in Australia and another 274 were mostly settled in New Zealand. The United Nations High Commissioner for Refugees has said only about 4 per cent of those processed on Nauru and Manus Island had been accepted by other countries. Opposition immigration spokesman Tony Burke said almost everyone who had been resettled from Nauru ended up being allowed to live in Australia. "The cost to the Australian taxpayer of the Pacific Solution is approaching $300 million. The centres on Nauru and Manus Island should be shut down," he said. "These Sri Lankans were interdicted off the coast of Christmas Island. "There is a purpose-built facility on Christmas Island where they were initially housed. The processing should have taken place there." Of the 83 Sri Lankans, one was told he had been refused refugee status. Eight cases were yet to be finalised including those of six Sri Lankans who were charged over the alleged sexual assault of a Nauruan woman. Seven Burmese asylum seekers, who have been on the island for a year, are also yet to have their claims assessed. AUSTRALIA is the "most appropriate" place to resettle 72 Sri Lankans on Nauru who were assessed as refugees, according to the United Nations High Commission for Refugees' regional representative, Richard Towle. The refugees want to come to Australia but the Immigration Minister, Kevin Andrews, in announcing the assessments yesterday, said the Government remained committed to finding another country to take them. Mr Towle said the UNHCR's position was "it's the responsibility of Australia to take care, assess and find solutions for them. We think the most appropriate place for that is Australia. "Our view is any delay is undesirable. It's [Nauru] a remote island in the Pacific, the physical conditions are adequate but this group of people has already been isolated and any further delay could be harmful," he said. The Opposition spokesman on immigration, Tony Burke, said: "The truth is, almost everybody who has been resettled from Nauru ends up being allowed to live in Australia. "Of those who were resettled from the group John Howard said would never come to Australia, more than 1000 were either resettled directly in Australia or were resettled to New Zealand, and New Zealanders have a right to enter Australia. Fewer than 50 were resettled in Europe or in North America." The Labor Party has said it would close the Nauru detention facility if it wins the election. A refugee advocate, Pamela Curr, warned that the decision to resettle the men in a "mythical third country" meant they would "languish on Nauru until they become so physically and mentally debilitated that Australia has no option other than to offer them a home here". In Nauru, the news had not been passed on to all the men. When the Herald contacted the asylum seekers yesterday, only 29 of the men had received letters from the department confirming they had refugee status. Sujetharan Arasalingiam, 29, said his letter stated resettlement would happen soon. "Everyone wants to come to Australia," he said, but they had been told they would be sent to another country. "There is no celebration here tonight. We are waiting for the results of the others." The United Nations High Commissioner For Refugees, the UNHCR, has welcomed Australia's decision to grant refugee status to 72 Sri Lankans held in its camp in Nauru. Yesterday, Canberra granted refugee status to 72 out of 83 Sri Lankans seven months after they were intercepted at sea en route to Australia. Australia's Immigration Minister, Kevin Andrews, says it is exploring resettlement options in other countries for the men, who will remain on Nauru for the time being. UNHCR's regional representative, Rick Towle, says it is unusual for Australia to look for a third resettlement country and it is unlikely another country will accept the men after Australia has granted them refugee status. Mr Towle says it is Australia's duty to find a solution. "No doubt Australia will look at their various options. They have the fundamental responsibility to find solutions for those people. Clearly, that will not be available on Nauru. If Australia is unable to find solutions with any other third country, then the final responsibility will remain with Australia." Rick Towle hopes they will be resettled quickly. Sri Lankan asylum seekers in Nauru say they are overjoyed to be granted refugee status and will accept placement in any safe country. Australia announced 72 out of 82 Sri Lankan asylum seekers intercepted near Christmas Island in February had been granted refugee status. The Sri Lankans, being held on Nauru, will be refused resettlement in Australia. One was refused refugee status, while other cases are still pending, including those accused of sexually assaulting a local Nauruan woman. Pulendren Pathmendra, 34, who has acted as spokesman for the group, is one of the asylum seekers who has been granted refugee status. Pathmendra said Australia was the group's first choice for a country to live in because the people were kind and they could have a good future, but he would resettle anywhere he was safe. "We want to come to Australia. If there is a problem we accept that. If the Australian government says we can't go there, we will accept that. "Any country is okay. Whether it is America or Sweden or Norway, it is no problem. We will go anywhere," Pathmendra said. He said Australian's reaction to the recent hunger strike on Nauru had been touching, with more than 1,000 emails of support. "People said 'Don't hurt your bodies and your minds'. We like Australian people, and that is why we want to come there," he said. He said a meeting with the Department of Immigration and Citizenship may explain where he was to be resettled. Immigration Minister Kevin Andrews said Australia would work with other countries to find a home for the Nauruan refugees. "I will start the process now and we'll have discussions with various countries around the world and we will try and expedite this as quickly as we can," Andrew said. He played down suggestions the Sri Lankans could be sent to the US under a refugee exchange deal agreed to in April between Canberra and Washington. "This is not a refugee swap with the US. That was just an agreement that formalised that the US is one of those nine or 10 countries around the word who will resettle refugees," he said. The Sri Lankans on Nauru had been on the island for about seven months after being taken there as part of the Pacific Solution, a policy designed to stop unauthorised boat arrivals reaching Australia. In addition to the Sri Lankans there are seven asylum seekers from Burma on Nauru, who have been there since September last year.